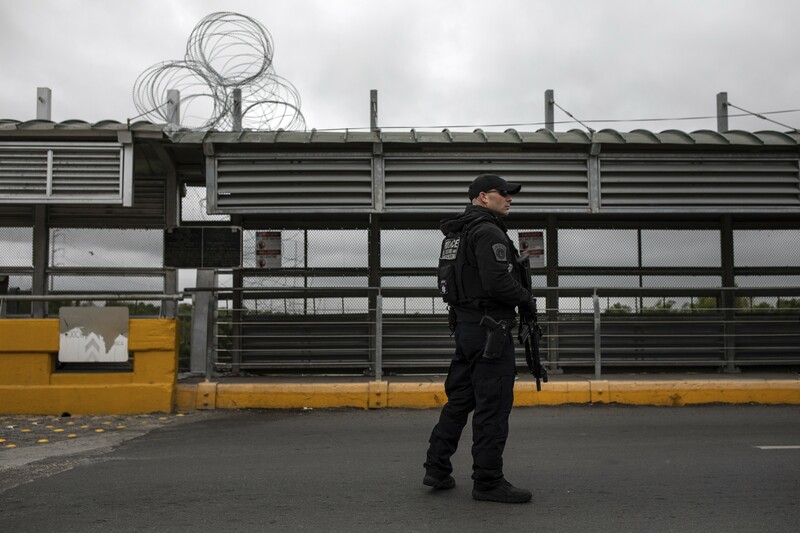 A Customs and Border Protection agent on a bridge between Mexico and Hidalgo, Texas, Nov. 9, 2018. ALBUQUERQUE, N.M. — The Border Patrol is taking the unusual step of shutting down its checkpoints across New Mexico and a swath of West Texas as officials scramble to respond to a surge in families requesting asylum along the Southwest border. A spokesman for the Border Patrol said the temporary measure was intended “to process and ensure appropriate care for those in custody.” The closing of checkpoints up to 100 miles inland from the border reflects the strain on border operations as the number of migrants entering the country continues to climb. Authorities closed checkpoints across the Border Patrol’s El Paso, Texas, sector, which includes 121,000 square miles in New Mexico and 4,500 square miles in Texas, to free more agents to work directly on the border. At some of the checkpoints on major highways, orange cones could be seen blocking access to the roads, along which motorists normally are funneled to checkpoints for queries about citizenship status and visual inspection of vehicles. Agents at the Border Patrol checkpoints arrest relatively few migrants in the country illegally, and most of those who are seeking asylum surrender to authorities at the border. The agents at the checkpoints deal largely with seizures of marijuana and other drugs from motorists. The checkpoints have emerged as a source of contention with human rights groups, which have contended Border Patrol agents routinely ignore their legal authority during the traffic stops to search people without warrants. Border Patrol agents in El Paso said last week that they had apprehended more than 400 immigrants in the country illegally during a five-minute period. Most of them were unaccompanied youths or people traveling in family units, the agency said. President Donald Trump has pointed to the influx of migrants as evidence of a crisis justifying his call for building a wall on the border.